Piet Hein (1905-1996) numbers among Denmark’s most well-known furniture designers. 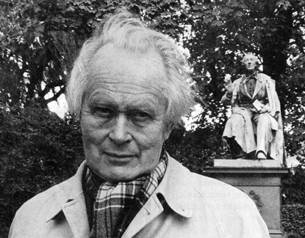 Piet Hein ’s educational background crossed such widely diverging lines as art, physics and philosophy, with Piet Hein often being called a universalist due to this diversity in his background. For Piet Hein , contradictions between art and science were no stronger than could be united under a common purpose, where science would contribute to solving an artistic problem and the artist’s creative powers could provide solutions that were scientific as well as creative. Piet Hein is most well-known for his furniture, especially the Super-Elliptical table. Piet Hein , however, has also developed a small number of lamps, e.g. 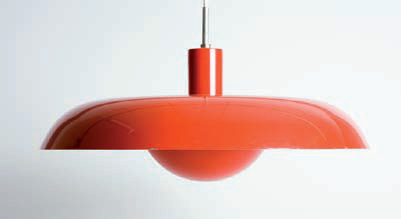 Sinus, the glass pendant lamp for Holmegaard, and various earlier models for Lyfa, including the Ra pendant lamp, which came in white, orange or red lacquered metal. This lamp is in production again today at Piet Hein A/S. Maybe it is due to Piet Hein ’s scientific approach to his art that many of his candlesticks and candelabra are called after celestial bodies such as Mars, Venus, Jupiter, Saturn and, not least, the Great Bear. 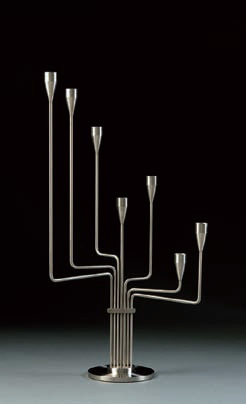 The idea for The Great Bear candelabra dates back to Piet Hein ’s period of exile in Argentina during the Second World War, when he had to leave Denmark as his wife was Jewish and Piet Hein himself was chairman of an anti-nazistic society. As Piet Hein greatly missed Denmark during his time in Argentina, and the Great Bear is not visible in the southern hemisphere, Piet Hein developed just one example of The Great Bear candelabra to remind him of Denmark and light during this dark period in his life. In the 1950s Piet Hein ’s The Great Bear was produced in brass in small editions. Later on it was produced by Piet Hein A/S (from 1999). The Great Bear is made for seven candles and the individual branches can be moved so they can stand in line or in a circle.